A low resolution image may correspond to multiple plausible high resolution images, thus modeling the super resolution process with a pixel independent conditional model often results in averaging different details– hence blurry edges. By contrast, our model is able to represent a multimodal conditional distribution by properly modeling the statistical dependencies among the high resolution image pixels, conditioned on a low resolution input. We employ a PixelCNN architecture to define a strong prior over natural images and jointly optimize this prior with a deep conditioning convolutional network. Human evaluations indicate that samples from our proposed model look more photo realistic than a strong L2 regression baseline. Science fiction fans recall this legendary sequence from Blade Runner, in which Deckard seems to pull inexhaustible details from a photograph using Esper photo analysis. 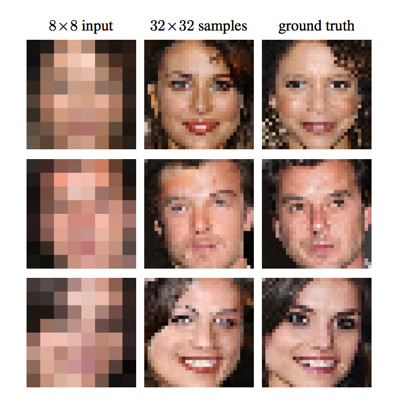 From via Pixel Recursive Super Resolution (pdf).